It’s a well-known fact that refined white sugar is bad for us; too much sugar can lead to diabetes, obesity, and a host of other ailments. Nonetheless, when our sweet tooth screams for attention, nothing but a little sugar will do. 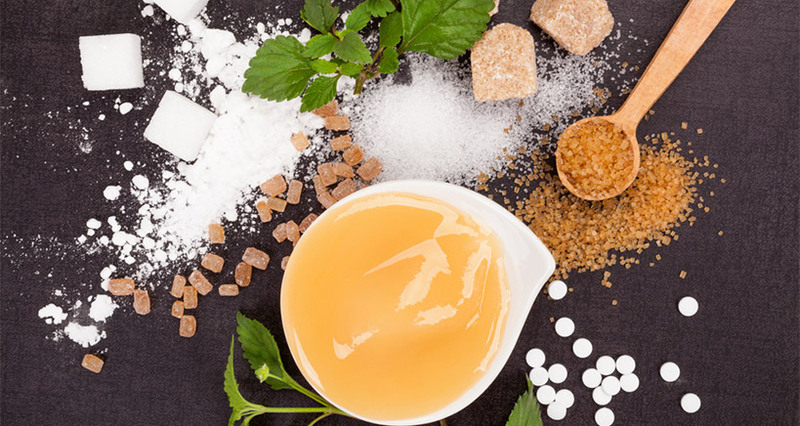 In the past, a craving for sugar could be satisfied to a degree with honey, maple syrup, or the sweetness of dates; today, however, consumers are demanding more, and food manufacturers are continuing to explore the sweet possibilities of new-fangled sugar substitutes. As the reputation of plain, white, refined cane sugar continues to take a beating, you will find that many of your clients are asking difficult questions about how you plan to incorporate sweetness in your menu without an abundance of white sugar. Read on to learn more about new-wave sugars and how they can work for you. Sugar cravings are hard to resist; when the urge comes upon us for something sweet, nothing else will do. The question, however, is why do so many of us have so little resistance to sugar. When we don’t eat enough calories – if we’re dieting drastically or just not eating properly – our bodies start looking for fuel as a fast way to catch up, and the instinctive search tends to lead to sugar, one of the quickest energy sources around. Our bodies are so stubborn that even when we try to fool ourselves by ingesting artificial sugars, we go right back to looking for the real thing. Only substantial and real food – the actual providers of energy – can break the cycle, and a craving for sugar will often subside when we eat healthy calories. Sugar intake can also simply be a bad habit; in other words, what seems like a craving may just be a reaction to a habit that’s both automatic and seemingly impossible to break. Break the sweet-treat habit and the craving may diminish as well. Sugar can also serve as an antidote to too much salty food. Unfortunately most processed and restaurant foods these days are heavily salted, and the saltier our food, the bigger our sweet craving. This is especially true when salt is added artificially to foods and not found naturally, like in olives or cheeses. The salt-sugar progression is a hard one to resist, which is why we tend to reach for a luscious dessert right after we finish a great, big portion of fries. Glucose: Glucose, also known as blood sugar, is important for keeping our body in top working order. When our glucose levels stray from recommended levels, we can quickly see and feel the unhealthy effect it has on normal functioning. Glucose is the simplest form of carbohydrates; it has one sugar. Our body uses glucose to create energy, and common sources of glucose are bread, pasta, rice, juices, dried fruits, fresh fruits and vegetables. Glycemic Index: All carbohydrates break down into sugar once inside the body, but the rate at which this happens varies among different carbs. That rate is the basis of the glycemic index (GI). This index ranks carbs and foods that contain carbohydrates according to their effect on blood sugar, from 0 (no effect) to 100 (pure glucose). As a rule, the more processed a carb-heavy food is, the higher the glycemic index. Fructose: Fructose is the simple form of sugar naturally found in fruit, some plants, and honey. When we take in moderate amounts of fructose in our diet from, say, a piece of fruit, it’s not a problem; but excess fructose can be. While glucose can be used by almost every cell in the body for energy, only liver cells can break down fructose, and when we ask our livers to process a lot of fructose there are consequences, such as a rise in triglycerides and free radicals. In addition, fructose leaves us feeling hungrier than ever; on the good side, however, it has less of an effect on blood sugar and insulin levels than other sugars, so it has a lower GI. What’s a Caterer to Do? If sugar is bad for us on one hand, but very hard to resist on the other, the solution to this conundrum is vital to the health and well-being of everyone, including your clients. No type of sugar will actually improve one’s health – if it were only that simple. However, if we switch out a lot of the white, refined sugar that we regularly use for a less-dangerous substitute we will be headed in the right direction. Sap sweeteners are often derived from the fruit or sap of a variety of plants, and although maple syrup is the most well-known of these sappy sweeteners, many more have entered the fray of late. The following is a list of some less well-known sap sweeteners which can often be used as substitutes in baking and cooking. Palmyra jaggery, marketed as SugaVida, comes from the sap of the palmyra palm tree flower, typically grown in India and Sri Lanka. Relative to white sugar, it’s a healthier alternative, as it is an unrefined sweetener with a low GI score and low fructose content compared to other sugar sources. The palmyra palm tree is said to be resistant to infections, and therefore there is no need to use pesticides or herbicides when it is grown. Use Palmyra jaggery as you would use sugar in cooking and baking. In an article entitled, “Is Maguey Sweet Sap the New Maple?” the Food Network touts the virtues of this sap-based sweetener. According to the article, this “sap is thicker than pure maple syrup, and, according to its producers, it is processed at temperatures low enough to retain a unique profile of naturally occurring phytonutrients, antioxidants, vitamins and minerals.” The tan-colored syrup is like a cross between maple syrup and honey, with a slightly fruity taste that has hints of caramel. The syrup is drawn from the Salmiana Maguey cactus, and it is notably low in glycemic sugars. Agave is derived from the agave plant, a succulent that is native to Latin America. It is often labeled as a healthy, natural sweetener, but actually it is highly processed before it reaches our shelves and tables, and it also has a significant amount of fructose (often up to 90%). Agave is hyped as a healthier sweetener due to its low glycemic load, but that’s probably because it consists mostly of fructose. Agave can be used as a vegan alternative to honey, but it packs 20 calories per teaspoon, which is more than granulated sugar. Coconut nectar comes from the sap of the coconut tree flower, and coconut sugar is coconut nectar that has been dried down to its crystalline form. Both the nectar and the sugar are minimally processed and have a relatively low GI score compared to table sugar. While coconut nectar and coconut sugar both contain fructose (around 38%-48%), they have less of it than agave does. Caterers should be aware, however, that although this type of sweetener imparts great taste, it does burn more quickly and easily than regular white sugar. Yacon syrup is made from the root of the yacon plant, native to South America. Called “the apple of the earth” in Peru, yacon looks like a potato in its original form and tastes a little like an apple. It has half the calories of regular sugar and due to its high fructose content, it has a low GI and it doesn’t significantly raise blood sugar levels. However, yacon passes through the intestines largely undigested, and, as a result, it can be harsh on the digestive tract, especially for people with IBS (inflammatory bowel syndrome). Yacon syrup can be swapped for other liquid sweeteners, like maple syrup, honey, or agave. It can be drizzled on oatmeal, stirred into tea, whisked into a salad dressing, and used as a glaze for roasted vegetables. Brown rice syrup is a thick, gooey sweetener made from fermented cooked brown rice. Although it is usually made from natural ingredients, the brown rice syrup we buy in the store is highly processed. On the plus side, brown rice syrup does not contain any fructose. It is a very sticky syrup and it will work well in your favorite granola bar recipe. Brown rice syrup isn’t overly sweet and its malty, mild flavor is very appealing. Sorghum syrup is made from the juices of the sorghum plant, which are boiled down to make a dark, rich syrup. Like brown rice syrup, sorghum syrup is typically made from natural whole grains, but it is highly processed with a high GI. Sorghum can be easily confused with molasses – they look and taste alike – but they have significantly different origins. Molasses was brought to the U.S. from the Caribbean, and it is a boiled-down derivative of cane sugar. The sorghum plant is a type of grass which hails from African and which spread throughout the American south due to its ability to withstand high temperatures. The syrup that is derived from this plant was originally developed as an alternative to molasses. Stevia comes from the South American plant, Stevia rebaudiana, which has leaves that contain natural sweet-tasting compounds. Stevia is hundreds of times sweeter than table sugar, but it contains no sugar and has no effect on blood sugar levels. 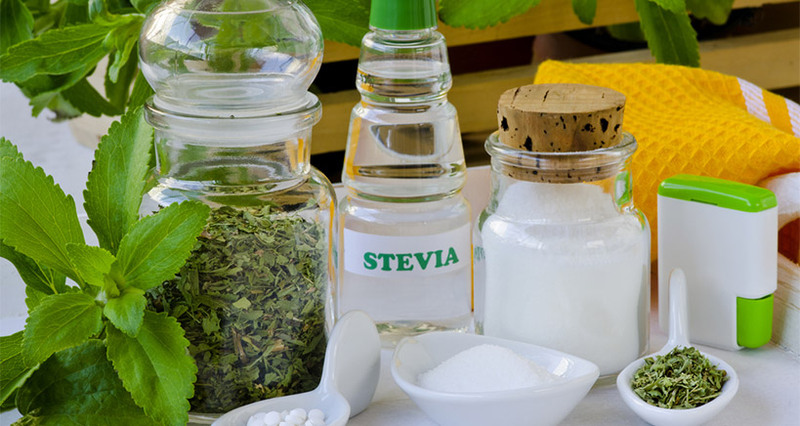 However, Stevia products can vary from relatively healthful whole-leaf powders to highly processed products like Truvia. Also, because Stevia is so sweet it can have a boomerang effect on sugar cravings. In other words, people who use this type of sweetener may cut down on sugar in the short term, but may end up craving intensely sweet foods as time goes by. A few drops of Stevia can be used to add slight sweetness to chocolate desserts like truffles or mousse, without adding unwanted calories. 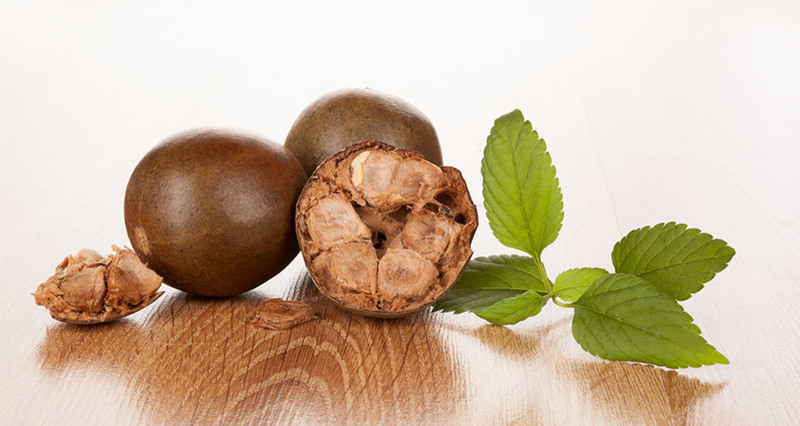 Monk fruit sweetener comes from the Siraitia grosvenorii plant, which is native to Asia. It contains sweet, naturally occurring chemicals that don’t raise blood sugar levels and that do not contain either glucose or fructose. Like stevia, monk fruit sweetener is much sweeter than table sugar, and, like Stevia, it can stimulate the body’s desire for sugar. Monk fruit sweetener is a good sugar substitute for someone with diabetes, so keep that in mind when you are preparing a menu for customers with special health concerns. None of us should be overdoing it when it comes to sugar, and, as a caterer, you can help your customers cut back by using some of the plant-based sweeteners available today in the marketplace. 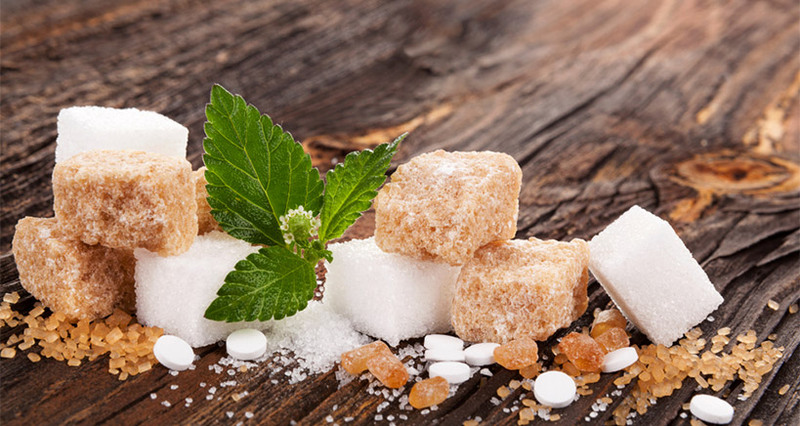 While none of these sugar substitutes offer a perfect solution, they are tasty alternatives to refined cane sugar, and your clients will appreciate the investment you are making in their health.